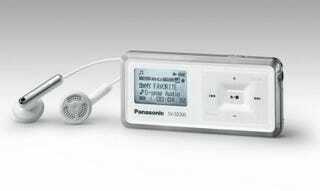 This SV-SD300 from Panasonic lacks any type of internal storage. The only memory it has is from external SD cards that you plug into its SD card slot. This, actually, may be a good thing, since the player only supports USB 1.1 for file transfers. You'll want to take out the SD card and use a card reader to load up your tunes. The other features, luckily, are a bit more 21st century. There's the 23-hour battery life, four-line black-and-white LCD and a simple 5 button interface. It's available for 79.99 ($149) from the UK.